Note: RSS is a format for delivering regularly changing web content. Note: This photo should be old and was taken aprox. 15 years before. Welcome to my homepage. You can find some information about me and my life here. Project of specific assistance to pregnant women, mothers and their children. The St Catherine’s Monastery preservation project is intended for young volunteers aged from 17 from all over Slovakia. Walk around Bratislava at night. Sunset on the Adriatic Sea. Vrátna valley in the Slovakia. Pictures of the ZOO Bratislava. 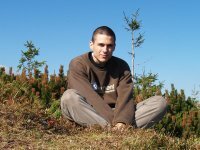 My name is Michal Novomesky and this is my website. My nicknames are: Nubian, Nubi, Nubianko, Neitos.